GoFormz workflow automation provides a way to automatically send an email based on various triggers — like when a form has been completed, or submitted by someone outside your account. You can specify the email’s distribution list, subject line, body text, and PDF attachment. Important note: This article is about setting up automatic email notifications at the template level via the Template Events window. See here if you want to set up automatic email notifications at the account level. You may want to automatically send a copy of the form to your customer once the form is completed. This is frequently used for customer-facing forms like work orders. You may want to use email as a notification tool, alerting an employee that a form has been assigned to them. You may want to share the form to stakeholders within your organization. For instance, when a work order form is completed for a customer, you may want to share its contents with that customer’s account rep. This person might not have a GoFormz account, but may want to know when a work order is fulfilled for one of their customers. To set up automatic email notifications for a form template, do the following. See here for more on automated workflows in general. 1. Navigate to the Templates Tab and click the form template for which you want to set up automatic email notifications. The Template Editor will launch. 4. In the When this happens section, configure the event trigger by selecting a User and a Trigger. In this example, the event will trigger whenever a user in the Supervisors group completes a form. See here for more on configuring triggers. 5. Select Email from the dropdown under Do the following. 6. Set the distribution list by adding one or more email address in the To:, CC: and BCC: areas, as shown below. When using multiple email addresses, use semi-colons to separate them. This field supports GoFormz Variables, which is very powerful because it allows you to insert an email address from your form right into the email distribution list. 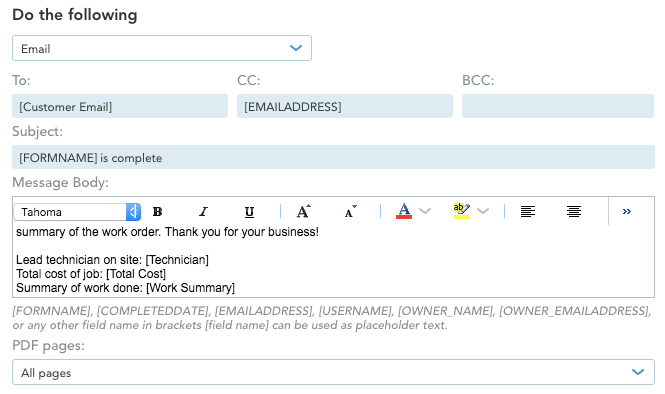 In the example below, the form is automatically emailed to the customer’s email address, as specified in the form’s [Customer Email] field. A copy of the email is also sent to the technician who completed the form using the [EMAILADDRESS] variable. 7. Enter the email’s subject line in the Subject area. This field also supports GoFormz Variables. The form name is included by default via the [FORMNAME] variable, but you can modify the text to suit your needs. 8. In the Body area, enter the boilerplate text for your email. You can use a selection of standard text formatting tools here, which let you change the font/size/color of your text, add bullets, change text alignment, etc. This field also supports GoFormz Variables allowing you to include any information captured in the form. In the example below, the final job cost and the technician’s work summary from the form are included via the [Total Cost] and [Work Summary] variables. 9. In the PDF pages dropdown, select which form pages should appear in the PDF attached to the email. The default “All pages” option will attach a PDF of the entire form. Additional options must be set up using the template’s Print Configs option. 10. Finally, click the Save Changes button at the bottom to finish setting up automatic email notifications.